I have a confession to make! 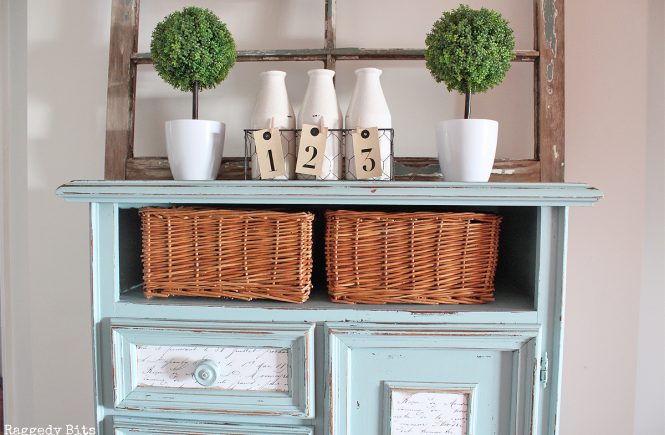 If you saw my recent posts on Sisal Rope Love Sign and 10 Minute Twig Tree, I was a part of a Simple Daily DIY Challenge. This involved a very talented group of ladies getting together and making projects of things that you generally have around the home. Well, it finished last week 😳 ….. and I still haven’t done 3 of the projects!!! Let’s just say that time has not been on my side!! The third challenge involved Mason Jars and that’s where my Simple Mason Jar Centerpiece stemmed from! Greenery Sprigs – I just used camellia leaves out of my garden. Anything will do. Old Cutlery – I found these sweeties at a local thrift store. 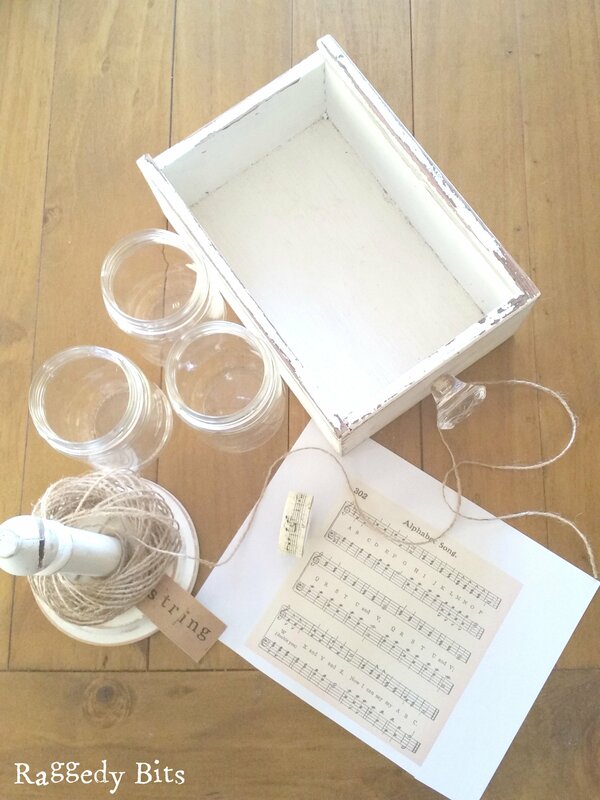 Once you have gathered up your goodies, print out the sweet Alphabet Song from over at Knick of Time. And don’t get stuck over there with all the other wonderful Vintage printables that Angie has available!!! Ok so you’re back now, let’s get back to work 😉 …..I was able to print 2 of the alphabet songs out onto one A4 size. You will need to print out 2 pages, but I’m sure you will find something else fun to do with the spare one! 🙂 Cut out you’re Alphabet Song Sheets and roll them up to form a cylinder. Using washi tape, tape the opening closed. Then pop some jute around each jar. 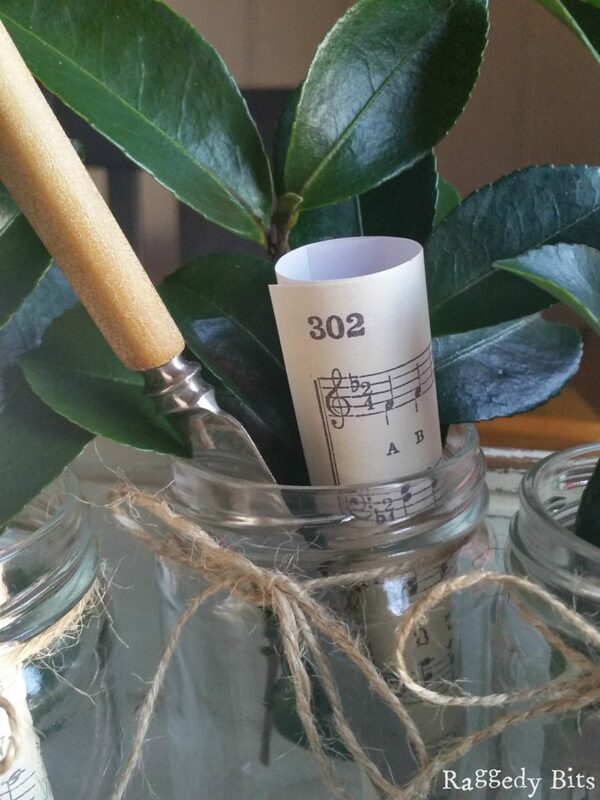 Pop some of the greenery into your jars along with the music sheets. 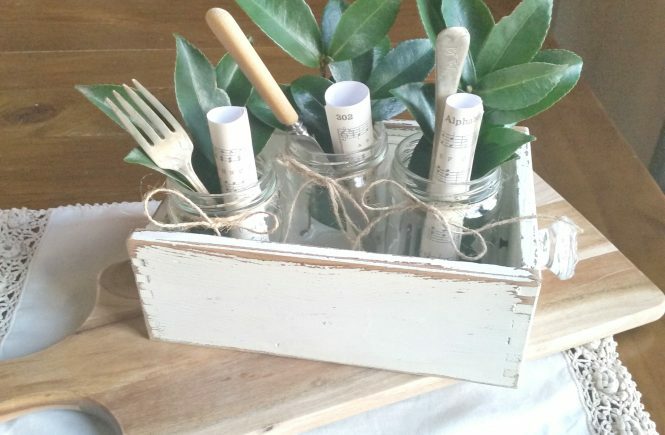 And then add your Vintage cutlery. 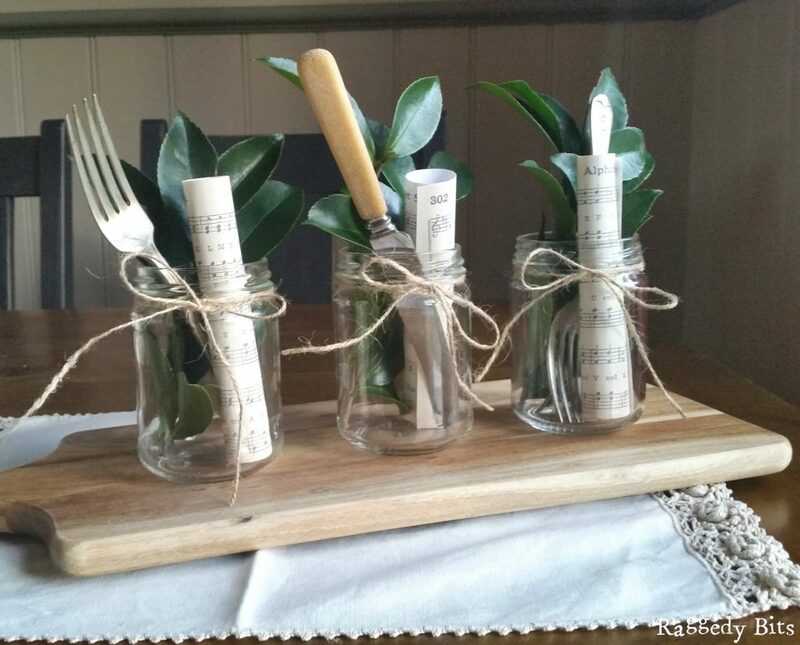 You can leave them as is or pop them inside an old drawer to make a very Simple Mason Jar Centerpiece. 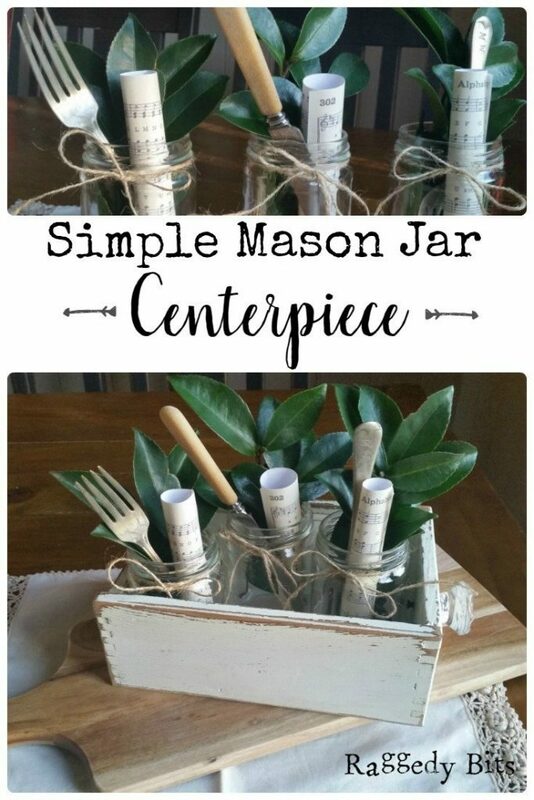 There you have a super simple Mason Jar Centerpiece. Even if you don’t have Mason Jars, save some condiment jars and use those instead. I’m with ya, simple deco’s with what you have at home are my favourite lately and I love the simplicity of your centerpiece! 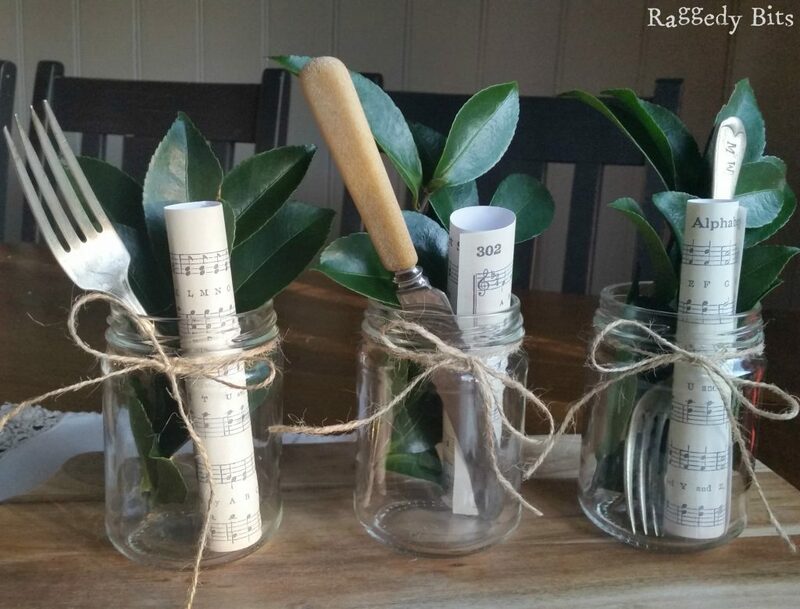 The green leaves are so beautiful and simple jars are just always great ! I love this, Sam! What a great idea! You have inspired me to make this. This is such a fun idea. Love the mason jars inside the old box! Super project Sam, I’m loving that sweet white wooden drawer! Thank you for sharing on the #OMHGFF this week, Pinned to share! 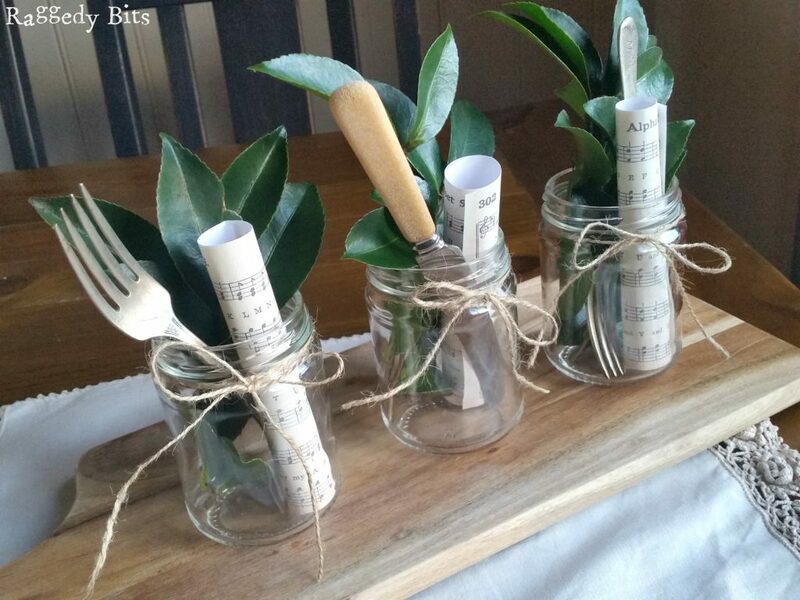 Wouldn’t our grandmothers be so surprised at how many things we do with mason jars? LOL Love it! You make me so envious, the simplest things in your hands turn into the best decor pieces. You have the coolest style and it looks so effortless when you put them together. So jelly! 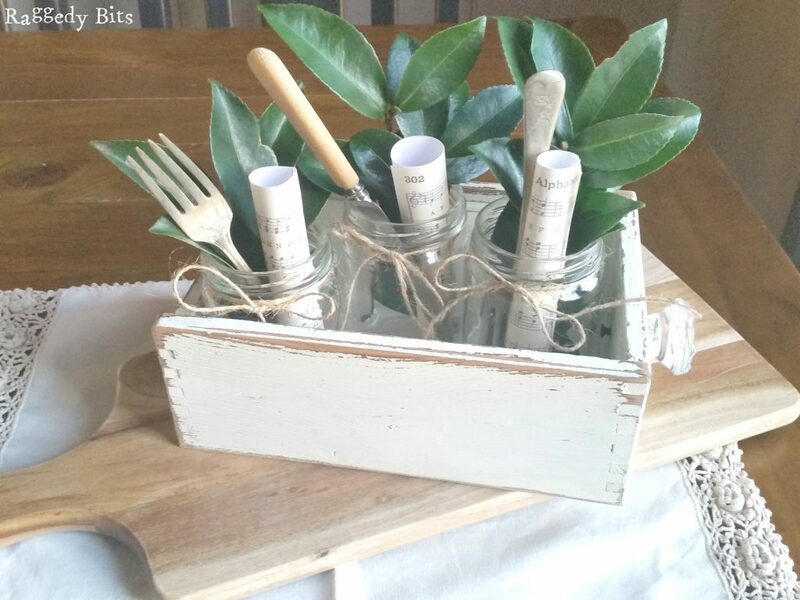 I love the cutlery added to the jar with all the other items, something a bit unexpected! Love it, Sam!! You did not disappoint! 🙂 Featuring you tonight @ Shoestring Elegance’s What to do Weekends Party!! This is so well put together Sam. 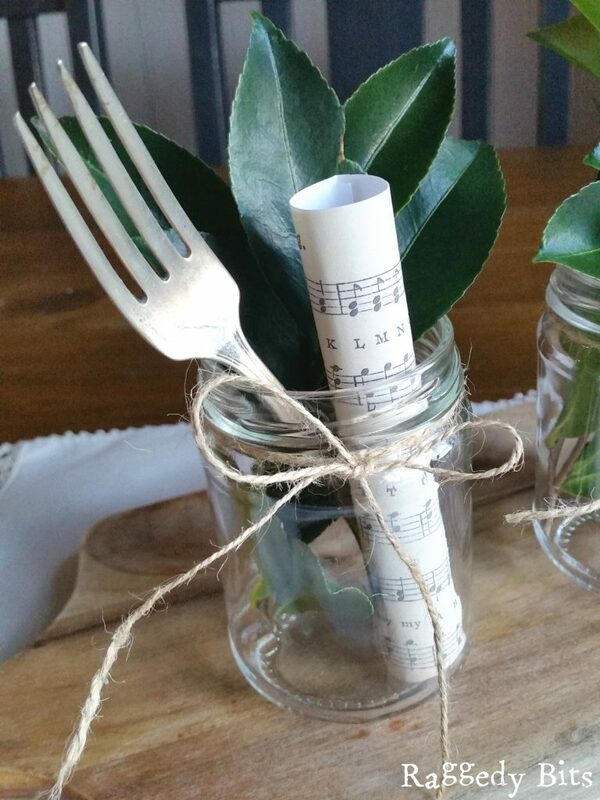 The combination of the music sheet, the greenery and the jute, and the special addition of the cutlery just makes the whole thing perfect. A lovely and warm centerpiece for any table that gives us all lots of sweet inspiration. Pinning and sharing. I love how you see a use for just about everything! Thanks for sharing at the DIY party! Very imaginative and pretty! 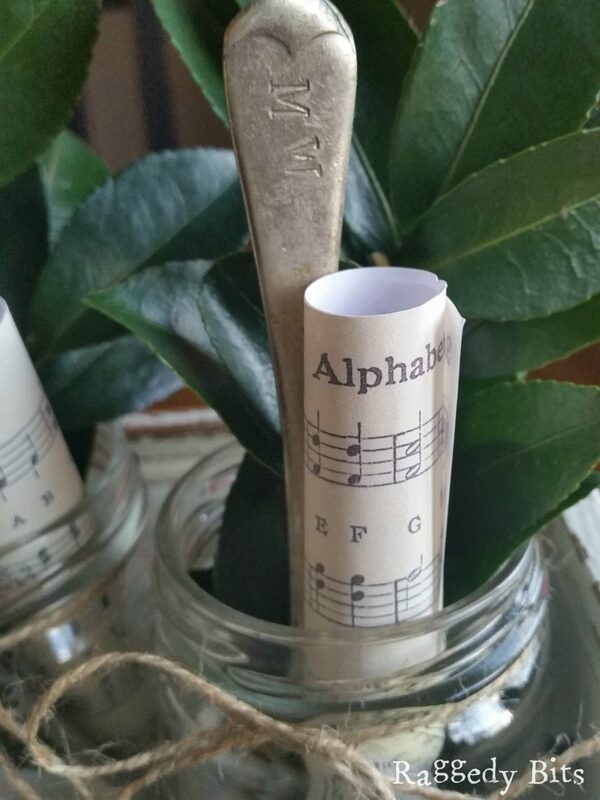 Nice touch with the music sheets! Love, love, love the music sheets! !